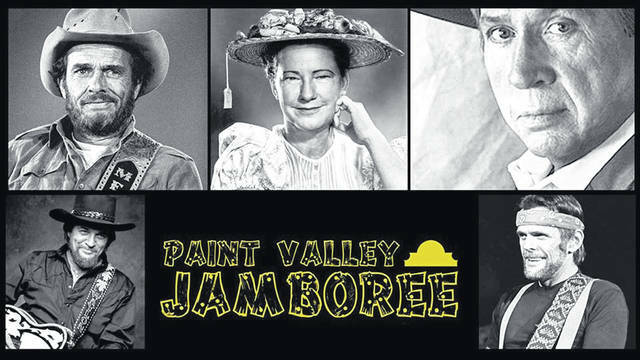 Some of the past performers at the Paint Valley Jamboree include, clockwise from top left, Merle Haggard, Minnie Pearl, Buck Owens, Johnny Paycheck and Waylon Jennings. What is reportedly Ohio’s longest running country music show, the Paint Valley Jamboree, will kick off its 55th season Saturday, Feb. 9 at the Paxton Theatre in Bainbridge. The show will start at 7 p.m. It has returned to its Saturday night time slot and will be held the second Saturday of each month, event organizers said in a news release. The 55th season kicks off with new emcee and band leader Rick Henderson, a Paint Valley Jamboree regular. Henderson has been performing since the age of 11 when he first sang the Hank Williams classic, “Your Cheatin’ Heart” at a VFW picnic in his hometown of Xenia, the news release said. Vocalists on Saturday will include Jamboree favorites LeighAnne Cooper and Tim Villars, as well as newcomer Preston Dailey. Cooper and Villars have years of history with the jamboree and were both eager to return for the first show of 2019. Dailey made his Jamboree debut last fall to much praise and was an easy choice for show organizers when putting together Saturday’s lineup, the release said. “The lights came up on the Paint Valley Jamboree for the first time on Feb. 27, 1965, when James Sweeney and Lou Harris formed a partnership to bring a live country and western show to the old Paxton Township Hall (also known as the Bainbridge Opera House),” the release said. “The jamboree grew wildly in popularity with its mix of local talent and Nashville’s up and coming stars of the time: Waylon Jennings, Dottie West, Merle Haggard, Connie Smith, Johnny Paycheck, Minnie Pearl, Conway Twitty, Loretta Lynn, Little Jimmy Dickens, Porter Wagnoner and many more. Doors open for each performance at 6 p.m. with the show starting at 7 p.m. Tickets are $10 and are available in advance at paxtontheatre.org or by calling 740-634-3333. The Paxton Theatre is located at 133 E. Main St., Bainbridge. For more information visit www.PaxtonTheatre.org.